The severe flooding in Queensland, Australia in early 2011 provided the inspiration for this print. 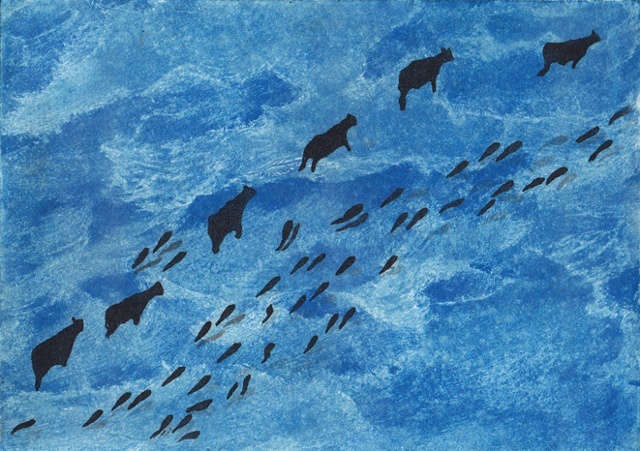 The high waters drove both wildlife and domestic animals, including cattle, from their normal habitats and, in my imagination, set them all afloat in the sea. The beasts and fish were printed from a solar plate etching over the water image from a silk aquatint plate. This print is one of a series in which the background "water" differs.